SERIOUS Investing: Should EPF reinvests into KFC? Unlike the McDonald's franchise, KFC is a franchise which has garnered quite a bit of corporate news in Malaysia over the years. If you noticed the history of KFC franchise in Malaysia, it has changed hands quite a few times. The reason for this is that KFC is a very strong franchise particularly in this region and over those years, the owners that controlled the franchise are never that financially strong to really stake their claims decisively. Hence, on one hand the franchise itself is attractive (as it is a strong cash generating business with good dividends) but on the other hand, parties that are acquiring the controlling stake are never able to consolidate their positions in the group. In its history of owners, most of them are having the wrong mindset when comes to its ownership - they see KFC as the golden goose - not knowing that it was still a business which they really need to nurture for growth. In 2005, with the assistance of CIMB as the debt financier, Johor Corp managed to take control of KFC via its control of QSR (holding company of KFC). Unfortunately, Johor Corp was exactly in the same mould as the scenario I mentioned above. They are never financially strong to see through it but on the other hand, they know that it is a golden goose. They are reluctant to sell the goose. In keeping the goose however, their debt ballooned. (CIMB as the hand that fed them will definitely not sit still and allow that to happen - as the nation's most INNOVATIVE investment banker, why not make more from other fees besides the income from interest). Hence, the pressure for the Johor Corp Group to restructure their finances. To restructure, they need to do something with KFC. 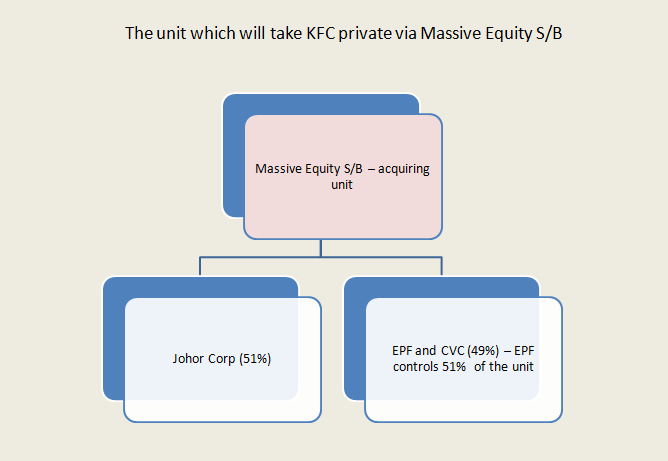 As in the above structure, although Johor Corp is able to control KFC, effectively it only has 15.1% stake in the fast food franchise. Even though KFC is the golden goose assumingly, there are not much to be reaped from the group once it reaches to Johor Corp. The 15% effective ownership is not going to solve its debt problem even though KFC gives good dividend. One must remember the prized possession here is KFC, not QSR and not really Kulim. 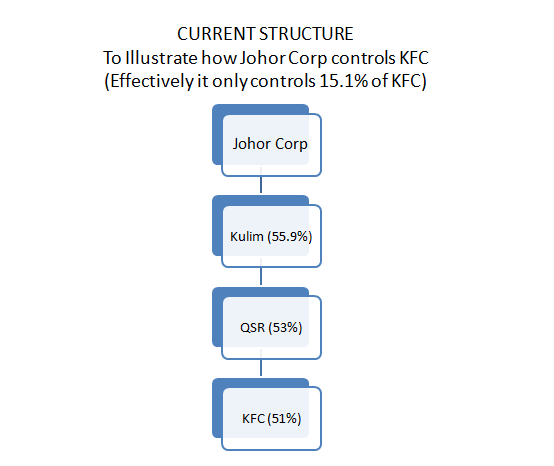 Johor Corp nevertheless has control of the group through the layered ownership despite the continuous mess surrounding KFC's structure. To top off the mess, the Johor Corp group made some related party transactions which from news pissed off EPF. In an unusual move EPF which owned some 10% of KFC sold off its entire invested stake in KFC. I am not sure what are the reasons which caused this but if you look at some announcements, KFC was buying several pieces of land from Johor Corp for development of new restaurant sites and other business purposes. Transactions like this would be hard to quantify especially on its valuations and other strategic reasons. Now with the new structure, EPF is back to KFC. It seems that EPF has already changed its perception in Johor Corp for them to now decide to have effective 25% control of KFC group. What makes them change their mind? Better control now? Tough one to convince I would say as the ultimate controlling shareholder remains the same. If those concerns however are really resolved, then I would say KFC is worth it as there are not many assets like this out there.